Scientists say they have identified the underlying reason why some people are prone to depression in the winter months, or Seasonal Affective Disorder (SAD). Difficulty regulating a chemical in the brain, serotonin, may explain why some people suffer from SAD, according to new research. Scientists at the University of Copenhagen, who studied brain scans from more than 30 subjects, found that SAD patients had different levels of a neurotransmitter that regulates serotonin in their brains during winter and summer months. Serotonin is thought to signal happiness in the brain, and, during the winter, the neurotransmitter that removes serotonin was present at higher levels. “We believe that we have found the dial the brain turns when it has to adjust serotonin to the changing seasons.” Lead researcher Brenda McMahon told the BBC. Brain scans reveal that those who have SAD, suffer from suppressed serotonin availability during darker days and longer nights. Using positron emission tomography (PET) brain scans, they were able to show significant summer-to-winter differences in the levels of the serotonin transporter (SERT) protein in SAD patients. “The serotonin transporter (SERT) carries serotonin back into the nerve cells where it is not active – so the higher the SERT activity, the lower the activity of serotonin. Sunlight keeps this setting naturally low, but when the nights grow longer during the autumn, the SERT levels increase, resulting in diminishing active serotonin levels.” Researchers said. Serotonin is manufactured in the brain and the intestines. 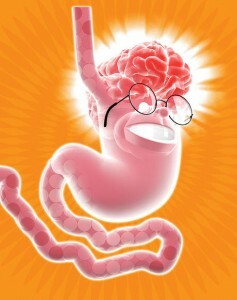 The majority of the body’s serotonin, around 90%, can be found in the gastrointestinal (GI) tract. It can also be found in the blood platelets and the central nervous system (CNS). Serotonin can be found widely across the body, it is believed that the chemical plays a role in influencing a variety of body and psychological functions. There are also many ways to increase your odds of reducing SERT’s winter hibernation. Testing your neurotransmitters is a step in the right direction—it will identify your levels of serotonin. Most of your serotonin is made in your gut, if you’re suffering from constipation, loose bowels, stomach aches, or indigestion your selling yourself short on some serious serotonin. Consider a 2-3 month trial of a gluten/dairy elimination diet if you experience digestive issues, constipation, diarrhea, IBS, acne, severe allergies, chronic sinus congestion, reflux, heartburn, thyroid issues, brain fog, chronic fatigue, migraine, eczema, or autoimmune disease. Eliminate problematic substances, such as diet soda, artificial sweeteners, MSG, processed soy, food coloring, additives and preservatives. Eat more protein and good fat. Protein is the precursor to serotonin availability and healthy fats are essential for a healthy brain and blood sugar stabilization, which keeps your mood from crashing. Purchase a jar of unrefined, cold-pressed, virgin, organic coconut oil. Take a spoonful upon waking, before bed, and when you get home from work. Always have a baggie of nuts on hand; eat 1-3 nuts every few hours. Recommended Nuts: brazil nuts, macadamia nuts, hazelnuts, pecans, pumpkin seeds, sunflower seeds. Eat fatty foods at regular intervals. Don’t wait until you get hungry. Anticipate and prevent yourself from getting hungry in the first place. Taking supplements to reduce inflammation and heal damage. Including L-glutamine, Omega 3 fatty acids, digestive enzymes, and a probiotic with Bifidobacteria and Lactobacillus. Get moving and get outside. Exposure to light and exercise increase serotonin. Experts agree that even if it’s cloudy or cold, getting outside helps SAD sufferers. 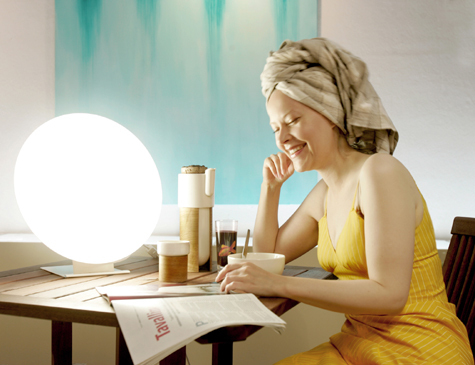 The natural light is still absorbed by your body. Studies have demonstrated that exercise is as effective as antidepressants. Aim for moderate exercise 2-3 times per week. If you have difficulty fitting it in, start small. Take a 5-minute walk after dinner, take the stairs at work, or yoga in your apartment. Try a mini trampoline if the weather is too cold, great for your entire body and mind! Use a 10,000-lux light box. Keep your eyes open, but do not stare directly at the light. Start with 15 minutes in the morning for 4 days, and then increase to 30 minutes every morning. If you have trouble fitting it in, at least have the light box on in your room while you get ready in the morning (better than not doing it at all).